Nintendo Switch is coming in March and here is what I think of it! 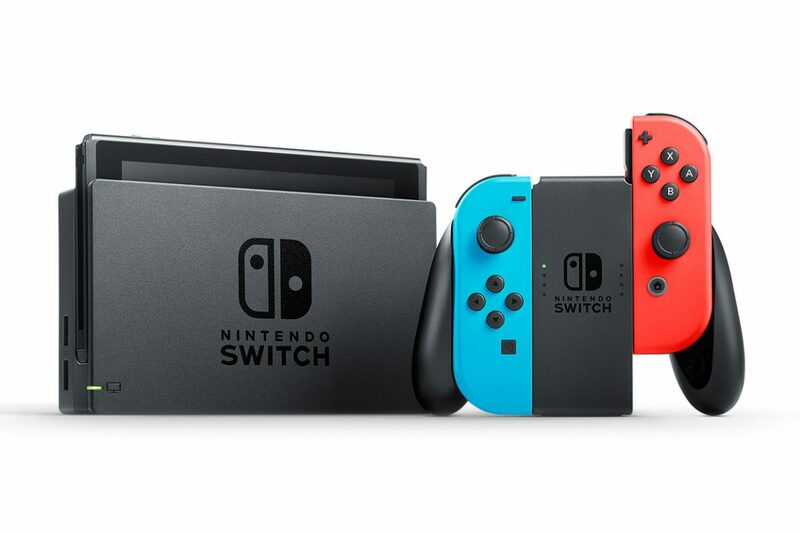 After months of speculation Nintendo has fully unveiled its upcoming console, the Nintendo Switch. Officially it is labelled as the successor to the tepid Wii U, but with its portability it has potential for more. Along with last Friday’s announcements and press unveiling Nintendo revealed the console will sell for 300 dollars from March 3rd onwards. While the price may have been a little higher than expected the console certainly received interest due to its novel concept. To boil it down. The Nintendo Switch is a portable console. It does have more in common with the PlayStation 4 and the Xbox One than it does with Nintendo 3DS. It just happens to be very small, small enough to be used as a tablet. So Nintendo has placed removable controllers to the side. These Joy-cons can also be detached and used in ways similar to the Nunchuck. When the Switch is used as a portable console it will run the image in 720p on its 6.2 inch screen. When it is fitted to the dock it will display the image on a TV screen in 1080p by boosting the graphics card. While the device is not as powerful as the PS4 or its Microsoft counterpart it is not a slouch either. Of course it cannot measure up to the PS4 Pro or the upcoming Scorpio, but both of those consoles rely on owners having 4k screens. For now the graphical quality of the games look promising, which brings me to the elephant in the room. Before the presentations on Friday anticipation was running high regarding which games would be released. On this score the presentation was an abysmal failure. Yes Zelda looks great, but what the hell is 1-2 Switch, I Am Setsuna, Super Bomberman R and Puyo Puyo Tetris? The lack of suitable adult games has opened a lot of old wounds on the internet. In my opinion, the company allowed Microsoft to needlessly take the second spot in the console race. Fans will say it is because Nintendo failed to cultivate the right game lineup. Far too few first-person shooters, racing games and sports games have been released since the N64. Nintendo turned their back on their fan base when they allowed companies such as Rare to be bought by Microsoft, Factor 5 to go bankrupt and Retro Studios become a husk of its former self. Microsoft made a conscious decision to develop Halo, Project Gotham Racing and Dead Or Alive 3 to appeal to teenagers. That decision paid off. Instead, Nintendo continues to state its consoles are for all ages which has only caused a downward spiral that has hurt its ability to be competitive. When it comes to games it is difficult to warm up to the Nintendo Switch. I can look beyond Zelda and Mario Odyssey and frankly I need more. Nintendo, where is Metroid? Where is Conker? Where is Perfect Dark and Star Wars Rogue Squadronre. Why aren’t you making games such as Knights of the Old Republic, GTA, Halo and and…. well where is the entire lineup of Xbox and PS4 games Nintendo fans will never get access to those if they spend 300 dollars on a console and 60 dollars per rehashed game. It is time to turn the clock back to 2001 and rethink how you got here. Nintendo for their part do not seem to acknowledge anything is wrong. The developers behind the Borderlands games recently stated they had been in contact with Nintendo to launch their upcoming Borderlands 3 game onto the console. However, the deal apparently fell through for reasons the developer does not understand. This incident seems to mark how Nintendo has dealt with their market and explains the Wii U debacle. Of course there are a number of potentially interesting games beyond Zelda and Mario. Steep from Ubisoft has received tough reviews but it is still in development. Then there is the F-Zero clone Fast RMX as well as Mario Kart 8 Deluxe and Splatoon 2. Though the latter is not my cup of tea. For those willing to travel back to Tamriel can get Skyrim Special Edition in the fall. I expect Fallout 4 to be released afterwards as well. Why it takes nearly a year to port Skyrim to the Switch is however beyond my understanding. Of course the Switch as a tablet may also be promising, but Nintendo has remained tightlipped. After all is said and done I am still not certain if the upcoming Nintendo Switch will be worth it. The ever declining variety of games for Nintendo consoles and the refusal of the company to admit that has caused a lot of bad blood. I can’t help but wonder that 5 years from now we will be playing Zelda on the Xbox Scorpio. I do believe the Nintendo Switch deserves a chance, Zelda is good enough to state that. However, it is solely up to Nintendo to convince us beyond Zelda. Previous story Outcast: Second Contact – Do we really want a remake?